Jake Thompson stole the show with all Ealandians’ goals as his side beat local rivals and holders Huddersfield Amateur 4-2 in last night’s Albert Crabtree Halifax FA Saturday Cup final at the Shay. A strong second half display, with man of the match Thompson to the fore, settled the contest in favour of the Yorkshire Amateur League side. It took Thompson just seven minutes to open the scoring when a quick break sent Colin Schofield racing down the right. He pulled the ball back for Thompson to apply a cool finish. The Amateurs hadn’t really got going but when Slater Barnes hit the angle of the post and crossbar Ealandians had a let off. At the other end Thompson had a shot well saved by Lee McGrath, from which the Amateurs broke swiftly to go the length of the field for Jacob Driver to apply the finishing touch to James Greenwood’s cross. This lifted Amateurs and they soon made it 2-1 when another ball from Greenwood found Matthew Jackson, who skipped round two challengers before slotting home. Ealandians came out strongly at the start of the second half but found the Amateurs defence hard to crack with Matthew Parker the king pin. 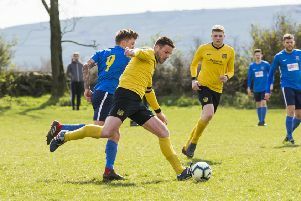 Ealandians, who fielded several players from the Warley Rangers side heavily beaten by the Amateurs in last year’s final, must have feared the worse, but Thompson turned things around by showing his paces to score similar second and third goals. Substitute Damon Nichols made a big impact for Ealandians, who soon made the game safe with an excellent team goal which ended with Jordan Burnham squaring the ball for Thompson to net his fourth. Ealandians; Tom Thornton, Ian Brock, Andy Hudson, James Parkinson, Brandon Gilling, Martin Coldwell, Chris Wdowczyk, Jordan Burnham, Ash Muncaster, Jake Thompson,Colin Schofield. Subs; Damon Nichols, Luke Johnson, Glyn Haley, Liam Senior, Carlton Balmer. Huddersfield Amateurs; Luke McGrath, Chris Conroy, James Encell, Adam Oldfield, Joe Bedford, Matthew Parker, Lee Thrush, James Greenwood, Matthew Jackson, Jacob Driver, Slater Barnes. Subs: Mike Hall, Matthew Eastwood, Nathan Hudson, Luke Wyczynski, Sam Le Gros Clark.